Registration is for all rec players 3 years old to 18 years old, PreK through High School. Registration will remain open until Friday, February 16th at 6p. – Spring rec registration opens 1/22/18 at 6a and will remain open until Friday, 2/16/18 at 6p. Registrations received after the close will incur a $15 late fee. Please make sure you register before the deadline. Due to the large number of players we have each season, we have been unable to accept late registrations in most divisions. •We accept all players 3-18. Players must be three years old by March 16, 2018. •The spring season will last for eight weeks. Practices for U8+ will begin the week of march 12th. Kindergarten will begin Friday, March 16th. PreK and U8+ games will begin Saturday, March 17th. •The season fee is $50, payable at the time of registration via credit cards only. There will be a late fee of $15 after 2/16/18 6p. •Games will begin the weekend of March 16th. •All of our rec coaches are volunteers. Please consider volunteering your time this season. Volunteering to coach can be completed at the time of your player registration. Contact Michelle Ireland, christiansburgsoccer@gmail.com, with any questions. •All players are required to have shin guards, athletic shorts/pants, ball (PreK, K, and U8 need a size 3 ball, U10 a size 4 ball, and U13+ need a size 5 ball), and water bottle. PreK is allowed to wear athletic shoes, ALL OTHERS MUST have cleats. No exceptions. •Team rosters will be posted 1-2 weeks AFTER the close of registration. •U18, two 90 minutes weeknight practices, one Saturday game. Some games may be double-headers and may be scheduled in the afternoon. •The Club provides a team jersey and one pair of soccer socks to each new player. Each player will receive one “home” jersey and one “away” jersey. Returning fall players are expected to use the jerseys distributed to them for the fall season. All new spring players will receive a new jersey set. If your fall player needs a replacement set of jerseys, please indicate that on your registration. •The scheduled ending date for the season is May 12th, with the following two weekends reserved for make-up games. We will be holding a tryout for the 2015 spring season in our U13B travel division. Date: Saturday, November 15th at 10 a.m.
Saturday is now looking like an unplayable day due to cold temperatures, high winds, and possible snow. While this is short notice, we would like to move up the final game to TOMORROW NIGHT, Thursday at 6:00 p.m.. We are asking that TEAMS, not individual parents, but the teams, to let us know as soon as possible whether their team could be available Thursday night. If tomorrow night is not possible for some teams, we would have to look at another Saturday morning, however temperatures are dropping quickly and there would be a significant chance that any future scheduled games could be cancelled. Parents, please let your coach know your availability so your coach can contact us today. Coaches, please reach out to your team today if you are not contacted by them directly. Specific team match-ups may have to be adjusted to accommodate team availability. We will need a response today in order to make the changes in the schedules by tomorrow. Registration is now open for all Recreation players for our upcoming fall season. Register early to guarantee placement. Registration ends: Friday, August 15th at 5 p.m. There will be a $15 late fee assessed to any registrations after August 15th. PreK – Practices and games each Saturday morning at 11:15. 20 minutes practice followed by a 20-25 minute game. K – Practices and games each Friday evening at 6 p.m. 25 minute practice followed by a 30 minute game. U8 and U10 – one weeknight practice and one Saturday morning game per week. U13 and U18 – two weeknight practices and one Saturday morning game per week. We’re excited to be able to host another fun-filled week of British Soccer Camp with Challenger Sports, the largest and most popular soccer camp in the USA and Canada. So clear your calendar for the week of July 21st; You don’t want to miss this camp. Hundreds of Challenger coaches each year have helped the company develop one of the most innovative approaches to coaching youth soccer in the US. Our experienced staff study the game at all levels and we have identified the key techniques and skills that your players need to work on and master to reach their true potential. >>> Click here to register. For more information, please contact: SEAN DATSON, at sdatson@challengersports.com, or toll-free at 877 439 9195 (follow instructions for Baltimore office). Visit Challenger Sports website for a complete listing of camps and additional programs. We recognize that those dates may not work for some families, and would note that Radford University and Virginia Tech also sponsor summer soccer camps. If your team is planning to order trophies for the end of the season, we highly recommend using New River Engraving. 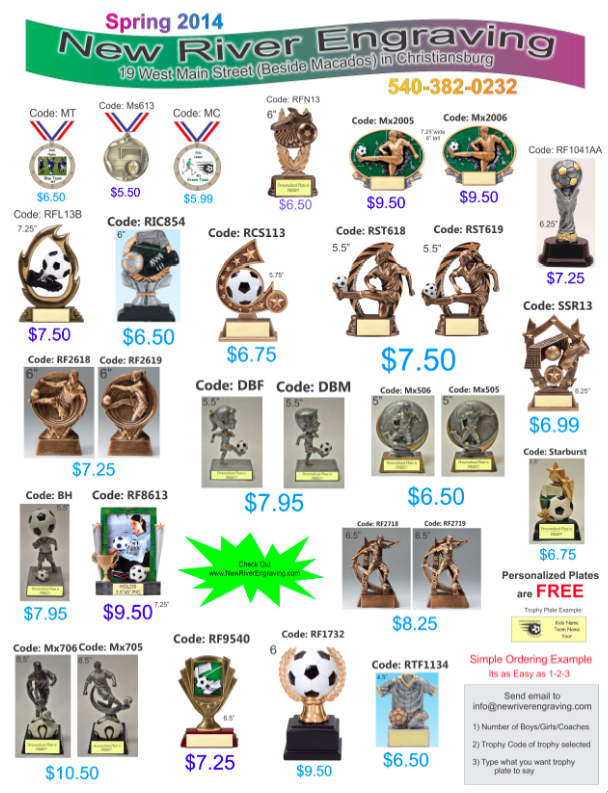 They have been a sponsor of our club since the beginning and to thank them for their continued support we ask that our teams contact them for their trophies or medals. Come join the Lady Demons on Tuesday, May 6th for an exciting evening of soccer. JV – 5:30 p.m./Varsity 7 p.m.
Any youth player (rec or travel) who wears their jersey to the game will be admitted free. The SWVA Elite U14 Girls hosted SVU in Blacksburg on Saturday 10/19 in a rematch of their September match, won by SWVA Elite 2-0. In the first half, the girls came out a bit sluggish and disorganized, and in the early part of the first half failed to properly defend a cross which SVU converted. The girls regrouped and found the better side of play by halftime. In the second half, the girls maintained a possession edge and generated more chances on goal than the opposition, but failed to convert any of them and ended up with a 0-1 defeat. The loss was the first of the league season for the U14 Girls after opening Skyline play with five consecutive wins. On Sunday 10/20, the SWVA Elite U14 Girls hosted Augusta, in a rematch of an early October match, won by SWVA Elite 2-0. In the first half, the girls again came out a bit sluggish and disorganized, and found themselves defending for much of the opening fifteen minutes of play. As with the Saturday affair with SVU, the girls got it together and dominated possession and the scoring chances for the remainder of the match. The girls next travel to CVU on Saturday, October 26th for a match involving the top two teams in U14 Skyline Premier division. The SWVA Elite U14 Girls team is playing under the NRU umbrella. It is comprised of 22 players from Christiansburg Soccer Club, New River United and Radford Soccer Club, and is coached by Erin Lycan, VT women’s assistant coach, and assisted by B.J. Flack (NRU) and Jason Mahugh (CSC).